Here is the simple solution to remove APPs from Windows 10 Start Menu! 1.) ... Removing the apps from the Windows 10 Start menu! 2.) ... Adding Apps to Windows Start! 3.) ... Adding Programs to Windows Start! 4.) ... Further helpful links and information about the Start Menu! See also: ► ... uninstall or delete Windows 8.1 / 10 Applications! 1.) Removing the apps from the Windows 10 Start menu! When you remove all APPs from Windows 10 Start Menu, The Start-Menu Look Like Windows XP or Windows 7 Start-Menu. (Image-1) Remove APPs from Windows 10 Start Menu! See also:... create desktop shortcut in Windows 10 for a program! ► ... clean up the app folder ! Windows 10 saves a history of the programs, files, folders, and websites you open, and displays them in the Start menu and in the Jump Lists on both the Start menu and the Windows 10 taskbar. You might choose to clear this history on Windows 10 periodically if, for example, you use a shared or public Windows 10 computer. Clearing items from the Start menu and Jump Lists doesn’t delete the items from your computer, and any pinned items remain pinned. 2.) Adding Apps to Windows Start! If you have removed all apps from the Windows 10 Start menu , the Start menu gets the look as familiar from Windows XP, or from the Windows 7 Start menu. (Image-2) Add APPs to Windows 10 Start Menu! 3.) Adding Programs to Windows Start! If you also like to start Standard Desktop programs via the Start menu in Windows 10, or from the desktop taskbar, you do not have to have a lot of Windows expertise. The desktop programs also give you the option to start them to make them even more accessible. Simply right-click on the desktop shortcut, or pin the program itself and to Start and the taskbar. Here in the example it is the calculator, but it can be linked to any program in the start. ► Create desktop shortcut in Windows 10 for program files! 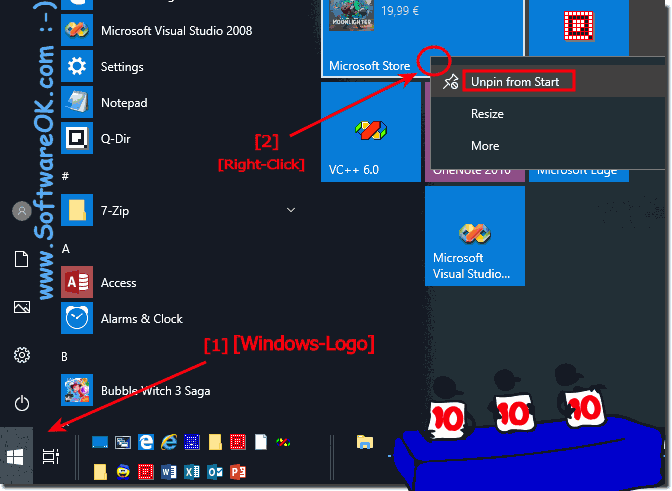 ► Open a program location in Windows-10! in the meaningful extension and optimization of Windows 10 start! 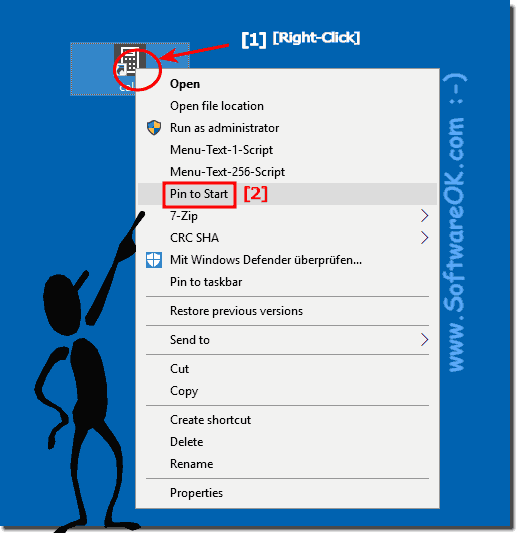 (Image-3) Add Programs to Windows 10 Start Menu! 4.) Further helpful links and information about the Start Menu! In this short FAQ with examples, you'll learn how to easily relieve the Start menu by removing unnecessary APPs and adding more important APPs and programs, or getting the directory from a specific program, for example,to create a program shortcut. The examples here have been created under Windows 10, but can also be used for Windows Server 2016! ►► ... Windows 10 all apps folders (open, find, delete) ! ►► ... find installed programs in Windows 10! ►► ... program name in the Windows 10 taskbar ! 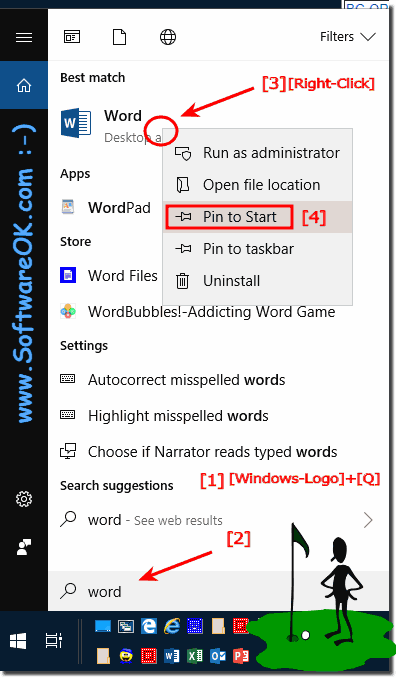 Customizing the Start menu in Windows 10 to suit individual needs from the user accounts on Windows is really a practical thing, but there are several ways here you can find in this short FAQ examples how to remove apps from the Windows 10 Start menu and can add again. Windows-10 - FAQ-9: How to remove APPs from Windows 10 Start Menu?